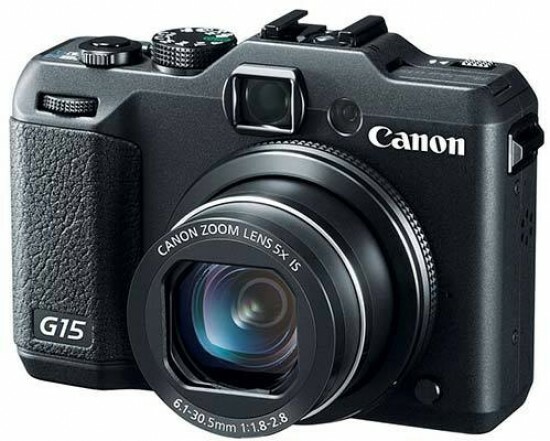 Reviews of the Canon PowerShot G15 from around the web. The Canon PowerShot G15 has had a lot of time to ponder its market position. It's been two whole years since the launch of the previous G12 model, and it's used that time wisely - the G15 is smaller, sports a new design and simultaneously crams in a far brighter aperture f/1.8-2.8 28-140mm equivalent lens. Canon's "G" line of cameras have always appealed to point-and-shooters looking for more of a pro experience. The new G15 has some great details—is it a $499 camera worth considering? The PowerShot G15 ($499) is the latest entry in Canon's long-running series of enthusiast compact cameras. This latest iteration addresses two issues that have plagued recent G-series models: the aperture range of the lens, and focusing performance. While previous models had lenses with a maximum aperture range of F2.8-F4.5, the range on the new PowerShot G15 is a much more impressive F1.8-F2.8. More light through the lens means better photo quality in low light. You'll also have a shallower depth of field to work with, for better background blurring. The Canon PowerShot G15 is the latest model in Canon's iconic G-series, originally launched back in 2000. Over the years these chunky compacts have become synonymous with no-nonsense design, fast lenses, and the kinds of physical controls and shooting modes, including RAW options, that enthusiasts are so keen on.